Taking a cue from its first indigenous aircraft carrier programme, India is now envisaging construction of its largest warship yet – a 65,000-tonne aircraft carrier named INS Vishal (literally meaning ‘huge’) with the latest fighter jets and choppers onboard. The warship is scheduled to enter the Indian Navy’s flotilla by 2025 and is presently in its design phase. 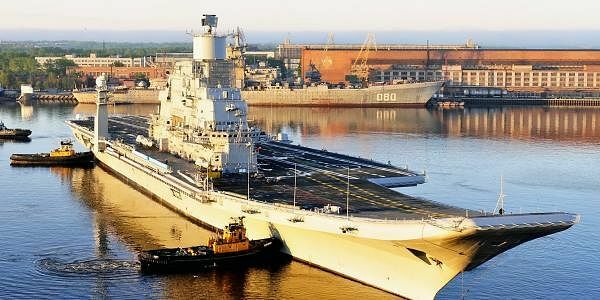 “Taking a lesson from delays faced in the construction of the first Indigenous Aircraft Carrier INS Vikrant, we have already begun working on the design of the next one with an added tonnage of 25,000 tonnes,” sources told Express. Where this sea leviathan will be constructed is yet to be finalised. Initially, the second aircraft carrier was also planned to have a 44,000 tonnage, but the Indian Navy put up a requirement for a flat top carrier with an extra 25,000 tonne displacement to make it a more potent platform. Russian Sukhoi Su-33 and MiG-35 and indigenous Light Combat Aircraft (Navy) fighter jets are likely to operate from the aircraft carrier. “The aircraft carrier is likely to have a catapult to launch fighter jets, mainly used in the US platform. So far the Indian Navy has operated ski-jump assisted launch of fighters,” sources added. The floating flying deck would also be capable of operating airborne early warning systems and mid-air refueller aircraft. Sources indicated that the ambitious project would cost around $ 2 billion, less than that of $2.34 billion-worth Russian Admiral Gorshkov. The Gorshkov will join the Navy as INS Vikramaditya by year-end. “INS Vishal is envisaged to join the Navy in 2025, when INS Virat will no more be in service and INS Vikramaditya and INS Vikrant would be guarding the eastern and western coastlines,” added sources.